Eleanor Wyld (Kate) and Linda Bassett (Edie). Photo by Mark Douet. Arriving at the Bush Theatre laden with accolades after a successful run at Dalston's Arcola earlier this year, there’s a buzz around Barney Norris’s debut play Visitors. It’s unusual for a story that deals with the tricky and often unpopular subject of ageing to get this kind of hype, let alone a second run so soon. But this thoroughly human take on the topic is well-judged and Norris confidently avoids the twin threats of misery and mawkishness that would no doubt have sunk a less skilful writer. Edie (Linda Bassett) has dementia and her mind is eroding. Yet though she is caught between the fogging mirrors of her distant memories, she remains intelligent enough to understand that it’s not her alone who is suffering. Her doting husband Arthur (Robin Soans) is closest to her collapse and it is for his sake that Edie pushes herself to remain lucid — her words acting as a light that can eradicate at least some of the fear of the gathering darkness. The bond between Edie and Arthur is at the heart of the story and is what makes Visitors work so well. In the first half, the audience can’t help but fall for the couple’s charms: their unconditional mutual support, the way they tease and joke, their evergreen fondness for each other. Played with warmth and sensitivity by Bassett and Soans, Edie and Arthur are everyone's ideal grandparents, which of course is what makes the second half, when the lights start to dim, all the more painful. The couple’s son Stephen (Simon Muller) is also trying to handle the situation, though he is doing less well. He and blue-haired young carer Kate (Eleanor Wyld) are the visitors of the title and represent the outside world arriving to ‘help’. Muller and Wyld do their best to flesh out these secondary characters, but it’s hard not to see them as adjuncts, employed chiefly to illustrate what to do and what not to do in this situation. That quibble aside, Visitors is a play full of vitality, and the nimble, sensitive direction by Alice Hamilton is also impressive. Try not to be put off by the grim subject matter: Norris is a playwright to watch out for. 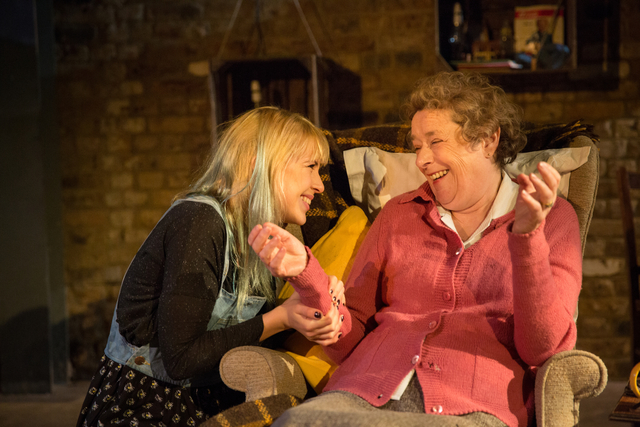 Visitors is on at the Bush Theatre until 10 January 2015. Tickets are £15-£19.50. Londonist saw this play on a complimentary ticket.